The weather was a little iffy in the morning but it didn’t deter the faithful golfers of The Nip. While the morning started off cloudy and with a few puddles left behind, it was going to be a great day spent with many friends. 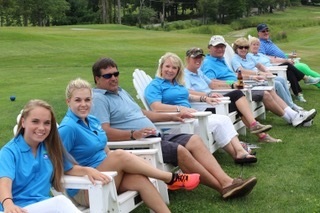 Once again our sincere thanks goes to our friend, Sharon Pirhala, and her great group of volunteers at the Lake Nippo golf course for an amazing fundraising event. Golfers got to play a fantastic 18 holes of golf and enjoy a lovely luncheon following. It never surprises me the great raffles Sharon is able to acquire for this event, happy winners getting their numbers drawn for cases of beer to local establishments and entertainment. It is alway a fun way to round out the day. The highlights of the day include Rebecca Kowalskisinking a ball in the putting contest to put her in the running with four others. Unfortunately her luck ran short and she wasn’t as lucky to sink another ball. Congratulations to the winner Tim Reilly. When the competition moved to the links, Dave and Ann Smith and Steve and Elaine Pierce came out on top- congrats for their fine playing! This was the fourth Golf event at The Nip but the 5th event that Sharon has hosted for the CMAK Foundation.